The Reichenbachfall is where Sherlock Holmes famously fought off Prof Moriarty. Many visitors come for the scenery and funicular ride. The Reichenbach Waterfalls near Meiringen in the Haslital of the Berner Oberland are amongst the most famous waterfalls in Switzerland. It is not the highest, strongest, or most spectacular waterfalls in Switzerland but visitors from all over the world come to see where Sherlock Holmes fought to the death with Professor Moriarty in 1891. 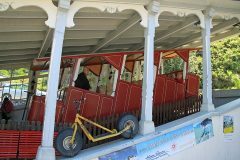 Many also enjoy the funicular ride for the views as well as an easier way to start hikes in the Reichenbach valley. On May 4, 1891, Sherlock Holmes and Professor Moriarty fell to their deaths after an epic struggle at the Reichenbach Waterfalls near Meiringen in Switzerland. In The Final Problem, Sir Arthur Conan Doyle attempted to rid himself of his most famous character in order to concentrate on more serious writing. However, fans and offers of riches convinced him to resurrect the famous detective but not his archnemesis around a decade later. Thus a plaque at the Reichenbach falls claims in three languages that “at this fearful place, Sherlock Holmes vanquished Professor Moriarty”. 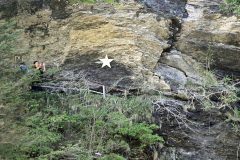 A large white star marks the spot where the fight took place – the waterfall has since moved much deeper into the mountain and is hardly visible today from where the two plunged to their deaths. A century ago, the ledge was within touching distance of the water. The popularity of the Reichenbachfall as tourist destination boomed with visitors from all over the world following the death of Sherlock Holmes. The Reichenbachfall-Bahn funicular train opened in 1899 and, despite a propensity to go bankrupt regularly during the early years, has been transporting thousands of visitors – 24 at a time – up to the waterfalls. The wagons are new but built to resemble the originals. The Reichenbachfall-Bahn funicular transports visitors 244 m higher into the mountains in 7 minutes. From the top station, visitors have spectacular views of the waterfalls and the ledge where the famous fight took place. Although the waterfalls have a total drop of 250 m, it is the 90-m high Upper Reichenbach Falls right in front of the funicular station that are the most spectacular. The upper funicular station is the start of many hiking trails in the valley. From here, a rather strenuous series of stairs allow hikers to reach the Zwirgi Hotel in around 25 minutes. From here, it is possible to hike down the mountain along various routes or to take “Monster Trottibikes” (large all-terrain scooters) down to the valley floor. To reach the ledge, it is necessary to first go up and then again down on the other side of the waterfall. 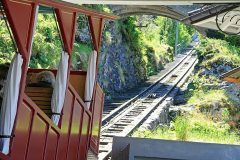 The Reichenbach Falls is of course always open but the Reichenbach-Bahn funicular operates only from mid-May to early October. The funicular departs every 15 minutes from 9 to 11:45 am and 1:15 to 5:45 pm (in July and August from 9 am to 6 pm). Return tickets are CHF10 for adults, CHF8 for children and CHF22 for families. One-way tickets and combination deals with other sights (including the Aare Gorge and Sherlock Holmes Museum) are also available. The Junior Card is valid and an excellent deal for families traveling in Switzerland. The valley station is behind a hospital complex on the left bank of the Aare River. From Meiringen station it is a 20-minute walk of take bus to Willigen, Klinik Reichenbach. Check schedules and timetables at Swiss Railways. Sherlock Holmes fans will of course not visit the waterfalls without also looking in at the Sherlock Holmes Museum in the center of Meiringen. It is around 15 minutes walk or a few minutes by bus or car away. Also worth seeing in the immediate vicinity is the spectacularly narrow Aareschlucht (Gorge).